There I was, walking across the University of California, Davis, campus to the Environmental Sciences Building for an agricultural communicators' meeting: a notebook in my hand, cell phone in my pocket, and my trusty pocket camera strapped around my neck. Sometimes it's good not to lug around a 10-pound camera. Not this time, however. 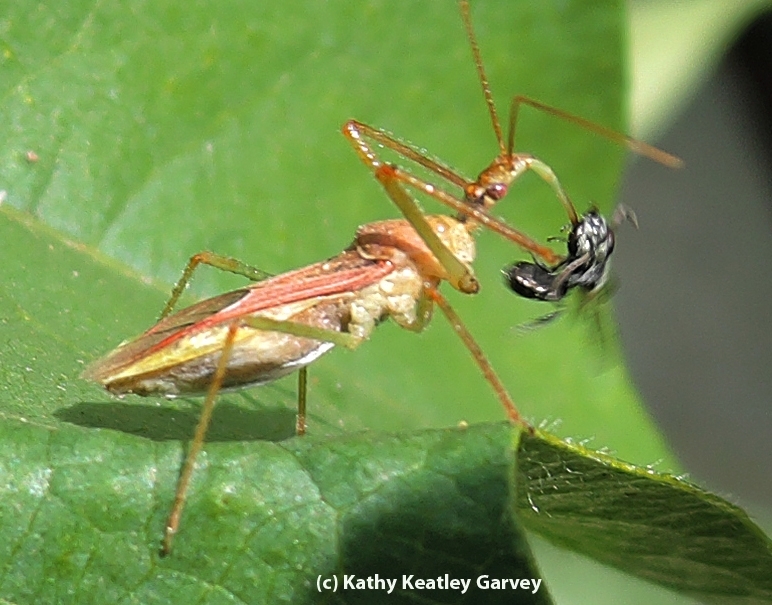 Right inside the soybean planter box, I saw it--an assassin bug spearing what looked like a bee. This was a predator-prey encounter between the assassin, Zelus renardii, and a bee, which native pollinator specialist Robbin Thorp, emeritus professor of entomology at UC Davis and an instructor of The Bee Course, identified as a male metallic sweat bee, Lasioglossum (Dialictus) sp., possibly L. tegulariforme. I aimed the tiny camera and grabbed a couple of images before the predator, with prey attached, crawled beneath a soybean leaf. 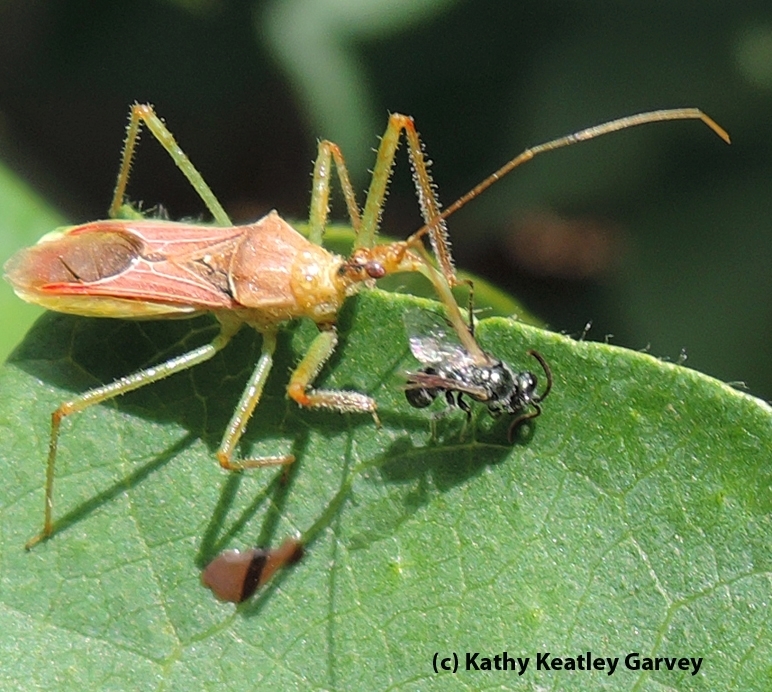 Assassin bug are predators and don't distinguish between beneficial insects and pests. Still, we like them in our garden because they eat a lot of soft-bodied insect pests like aphids and leafhoppers. Speaking of eating insects...the UC Davis Honey and Pollination Center is sponsoring a "Bugs and Beer" event on Saturday, Nov. 1 in the Robert Mondavi Institute for Wine and Food Science. It promises to be a cricket-kölsch kind of affair. Beer expert Charlie Bamforth, Anheuser-Busch Endowed Professor of Malting and Brewing Sciences at UC Davis, will lead a joint tasting with celebrity bug chef David George Gordon, author of "The Eat-a-Bug" cookbook. Bamford, known as "The Pope of Foam," is an icon around campus and the beer-brewing world. He's considered one of the country's most intriguing professors, noted Amina Harris, director of the Honey and Pollination Center. And David George Gordon--a fellow with three first names? He's been featured in the Wall Street Journal, Time magazine, and the National Georgraphic Kids. Registration opened Monday (http://www.rmi.ucdavis.edu/events). Tickets are $50, general admission, and $25 for students. And, of course, "Bugs and Beer" is open only to those 21 and over because beer will be served. We don't know what kind of bugs Gordon will serve, but they probably won't be assassin bugs. Bees, maybe. Specifically, maybe that "Three-Bee Salad?" on his website? Every time I see a golden jar of honey, I'm reminded of the Cordovan bee (Italian subspecies) that visited the Garvey bee garden back in 2010. 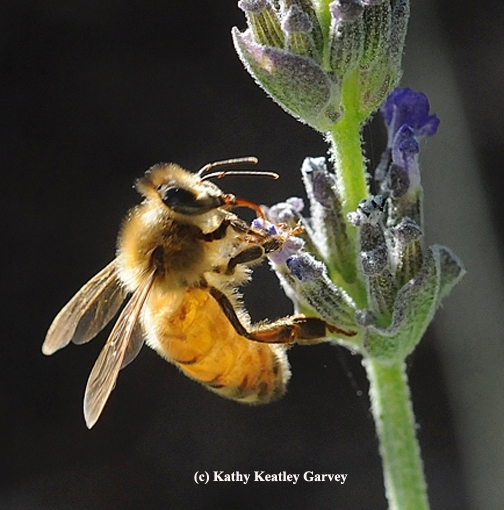 I managed to capture a photo of her and labeled the image "Golden Bee Nectaring on Lavender," because that's what she was doing. Nectaring on lavender. And she was golden, the most beautiful bee I've ever seen. 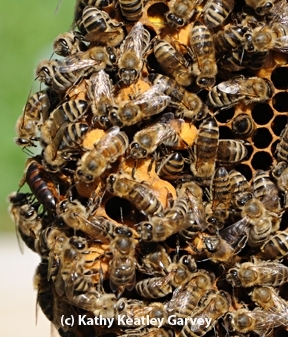 Other bees have almost lived up to the "gold standard," but not quite. So when Amina Harris, director of the Honey and Pollinator Center, located in the Robert Mondavi Institute of Wine and Food Science, today announced the publication of the Honey Flavor Wheel, I immediately thought of my favorite golden bee and my favorite honey varietal: starthistle. The starthistle is an exotic, invasive weed that farmers hate (and rightfully so) and beekeepers love (and rightfully so). The flavor is exquisite. And the color is golden. What's the Honey Flavor Wheel? Well, have you ever sampled wine and overheard the comments about it? You'll hear about the color, the clarity, the swirl, the aroma, the taste and "the finish." I've heard folks comment "I taste a little corn...Oh, that's a puzzle to my palate." A puzzle to me, too. I've never tasted "a little corn" in any glass of wine. Now with the UC Davis Honey Flavor Wheel, you can describe the honey you're sampling. “I have always been astonished by the range of flavors in honey,” Harris said. “And its aromas, too. Developing the wheel has been an astonishing learning experience at all levels. I now truly pay attention as I taste many different kinds of foods. I notice flavors from beginning to end. 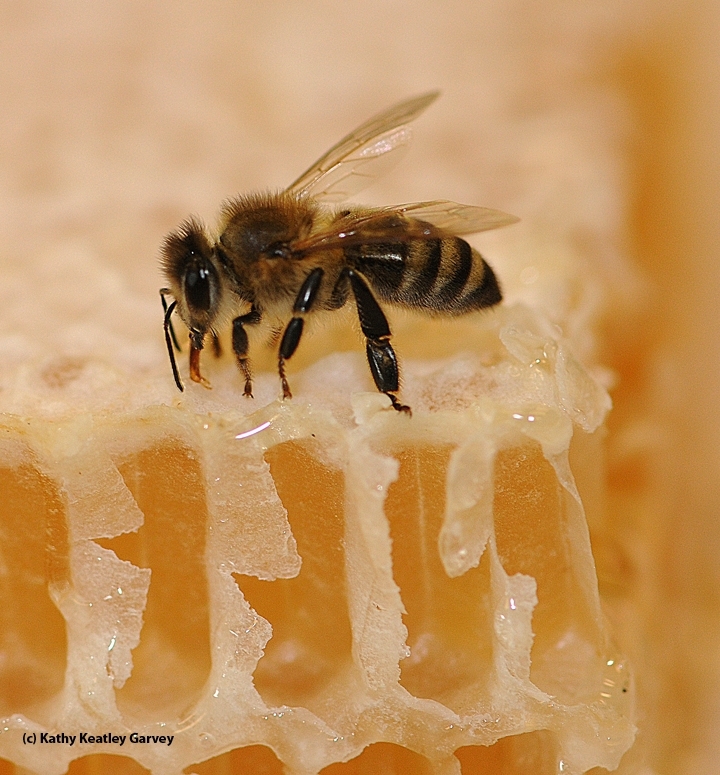 “This gives a huge lexicon to the tastes and aromas we find when tasting honey,” Harris said. Harris' favorite honey? Sweet clover, not to be confused with clover. “Sweet clover is a tall, five-foot wildflower that grows in profusion in Montana, the Dakotas and elsewhere in the high plains of the United States,” Harris said. “It is light in color, spicy with a wonderful cinnamon hit!" "And that is how I feel, too!” Harris said. 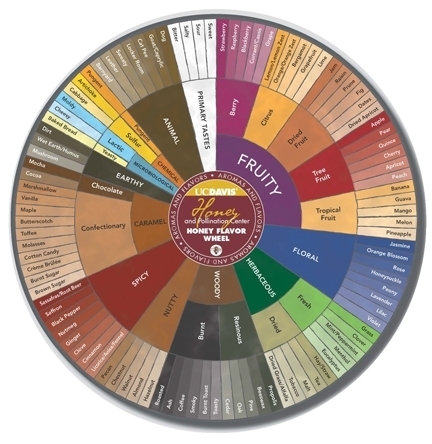 The front of the colorful wheel shows the descriptors, including fruity, floral, herbaceous, woody, spicy, nutty, confectionary, caramel and earthy. No longer can you just say “sweet” when you taste honey or “sour, salty and bitter.” If it's fruity, can you determine if it's berry, citrus, dried fruit, tree fruit or tropical fruit? If it falls into the confectionary category, can you pinpoint marshmallow, vanilla, maple, butterscotch, toffee, molasses, cotton candy, crème brûlée, burnt sugar or brown sugar? There's even an “animal” category” where you can opine that your honey sample reminds you of a barnyard. The back of the Honey Flavor Wheel relates how to taste honey and shares four honey profiles (Florida tupelo, California orange blossom, Northwest blackberry and Midwestern clover) “so the consumer can get an idea of how to use this innovative product,” Harris said. The Honey Flavor Wheel, measuring 8.25 inches, sells for $10 each with all proceeds benefitting bee research at UC Davis. The wheel is available at the Robert Mondavi Institute for Wine and Food Science and soon will be available online, at the UC Davis Campus bookstore and at the downtown Davis Campus Bookstore. This will be a definite conversation piece for all honey enthusiasts. However, when I taste wine, I don't get "corn." When I taste honey, I don't get "goat." Now what if a honey enthusiast tasted both corn and goat...and a wine aficionado tasted both honey and goat? It's not just the taste of honey. It's the taste of honey AND mead--coupled with a gourmet dinner on the UC Davis campus. 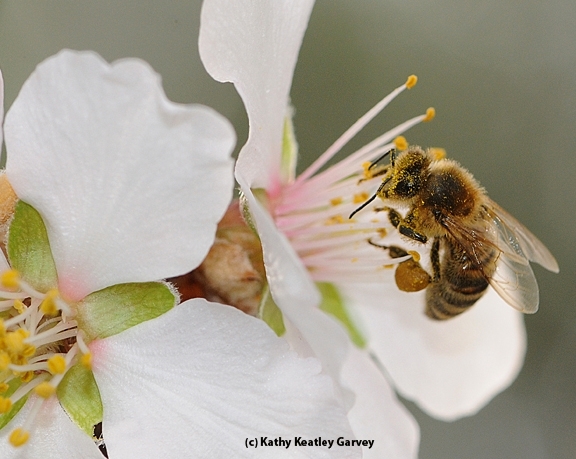 The UC Davis Honey and Pollination Center is sponsoring the Mid-Winter Beekeepers Feast: A Taste of Mead and Honey on Saturday, Feb. 8 from 6:30 to 9:30 p.m. in the foyer of the Sensory Building, Robert Mondavi Institute of Food and Science, 392 Old Davis Road. It's like "Bee My Valentine." "The air will be redolent with the sweet smells of roasting lamb and flavored honey," said executive director Amina Harris. It's billed as a Valentine's Day event and a celebratory meal benefitting the Honey and Pollination Center. The guests will start with these appetizers: Cracked Dungeness crab on Belgian endive and shitake mushroom soup shots. And the drinks, of course, will feature mead from Heidrun Meadery, along with sparkling water and a wine selected for each course. Salad is next: navel and blood oranges over winter greens with a tupelo honey vinaigrette. Following the main course, a cheese course with honey comb will be served. For dessert: Häagen-Dazs Honey vanilla ice cream with old-fashioned butter cookies. And then, a mead flight with three meads. Harris says the printed menu will be something folks will want to take home. Vicki Wojcik, a member of the Honey and Pollination Center Advisory Committee and the research director at Pollinator Partnership, will add pollinator notes to the printed menu--indicating which foods are pollinated by bees. The dinner, designed by Ann Evans and Mani Niall, will be catered by the Buckhorn, Winters. 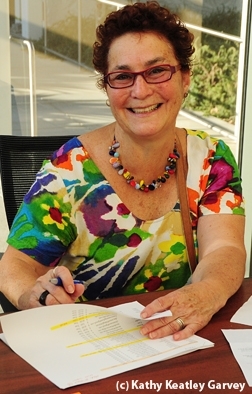 Evans is the founder of the Yolo County Slow Food, the Davis Farmers' Market and the Davis Farm-to-School Program. Niall is the author of numerous cookbooks including "Covered in Honey" and "Sweet." He describes himself as the "chief cupcake froster" at his newly opened Sweet Bar Bakery in Oakland. Darrell Corti, an international wind judge, will lead the mead flight tasting. Also planned: music and a silent auction. "Prizes are still coming in," said Harris, who can be reached at aharris@ucdavis.edu. Tickets for the one-of-a-kind event are $125 per person, or a table for eight for a $1250 sponsorship. It sounds like a bee-utiful evening, made possible by the bees! You like the taste of honey, right? The UC Davis Honey and Pollination Center is planning a "Mid-Winter Beekeepers Feast: A Taste of Mead and Honey" on Saturday, Feb. 8 in the foyer of the Sensory Building, Robert Mondavi Institute for Wine and Food Science. The gala, one-of-a-kind event will take place from 6:30 to 9:30 p.m. and will include appetizers, drinks, salad, main course, cheese course with honey comb, and dessert and mead flight. Great food? Indeed! Check out the menu, the kind you’d find at a five-star restaurant. Cracked Dungeness crab on Belgian endive, and shitake mushroom soup shots. Designing the menu: Ann Evans, nationally known consultant in consumer food and agricultural education and founder of Slow Food Yolo County, and chef Mani Niall of the Sweet Bar Bakery, Oakland, and author of “Covered in Honey” and “Sweet." The Buckhorn of Winters is catering the event. The buzz around the UC Davis campus is a June luncheon. Not just any luncheon, but "A Luncheon in the Garden." 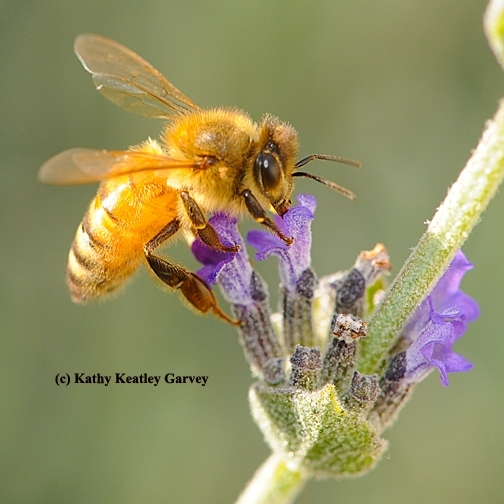 The UC Davis Honey and Pollination Center, directed by Amina Harris, is gearing up for the event, to be held Saturday, June 2 from noon to 3 p.m. in the UC Davis Good Life Garden, by the Robert Mondavi Center for Institute for Wine and Food Science. 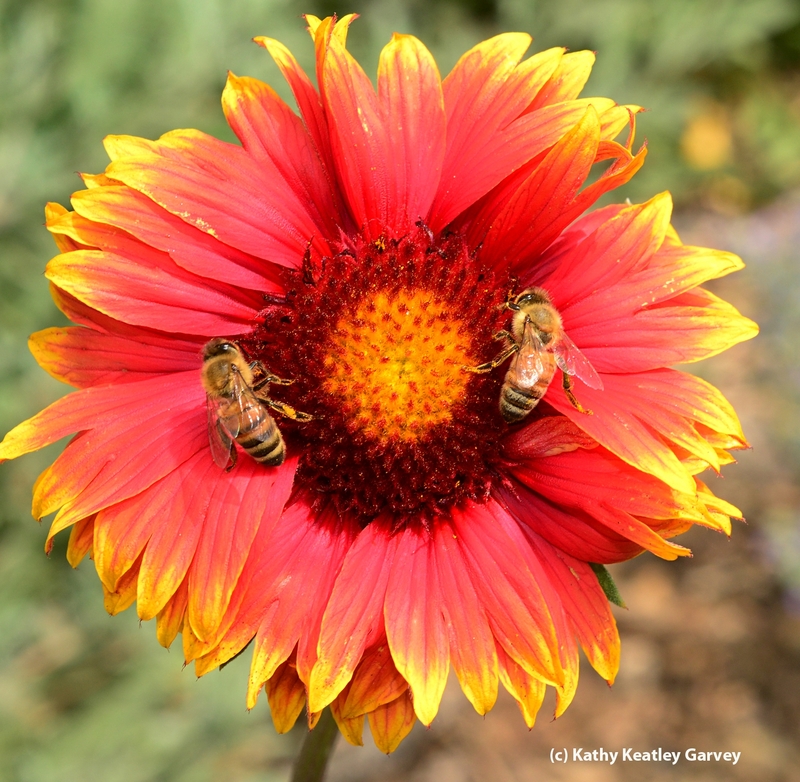 Its purpose is to introduce and support the UC Davis Honey and Pollination Center to the community. As Harris describes it: "A dazzling five-course meal will be served, from appetizers to cheese and desserts. Each course features honeys from around the globe. Food and drink created by chefs, apiaries, wineries and meaderies and the farmers of California." Promote the use of high quality honey in the California market, help ensure the sustainability of honey production in California, and showcase the importance of honey and pollination to the well-being of Californians. Tickets are $125 per person. A limited number of tickets is available. "A Luncheon in the Garden" promises not only to usher in June, but provide honey and mead enthusiasts and food connoisseurs with a day to remember. The last day to register is May 24. For more information, contact events manager Tracy Diesslin at (530) 752-5233 or at tdiesslin@ucdavis.edu.